My importer had a broken monk spade. I asked him for it. He sold it to me cheap. I dismantled the rivets and remounted them on a birds-eye maple staff I varnished. Wow. What an amazing monk spade. I taught classes at Liberty Park from 1992 to 1999. In the winter we'd have to wear double socks and thermal underwear. 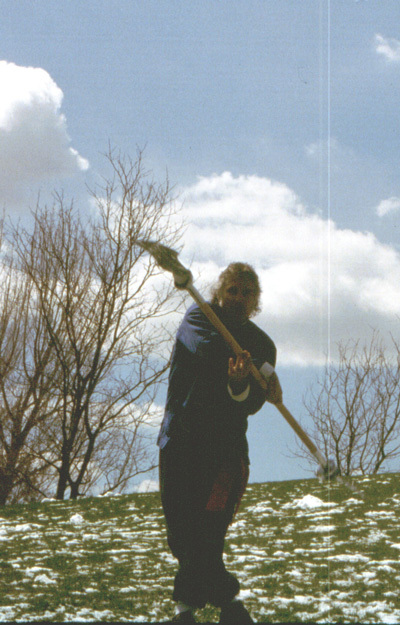 I taught through Salt Lake City Continuing Education Program also, so I always had indoor locations for students. But sometimes it was fun to brave the elements or harmonize with the extremes of cold and heat... But we never did Kung Fu in the rain, or high winds. This is me all sweaty after a Kung Fu performance with my Shaolin Chi Mantis demo team. 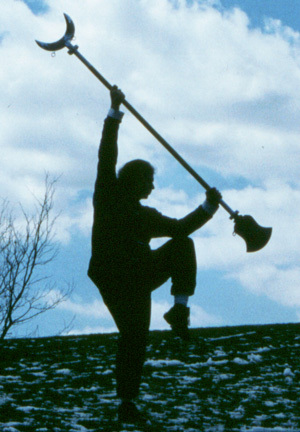 The Shaolin Monk Spade is my favorite halberd. 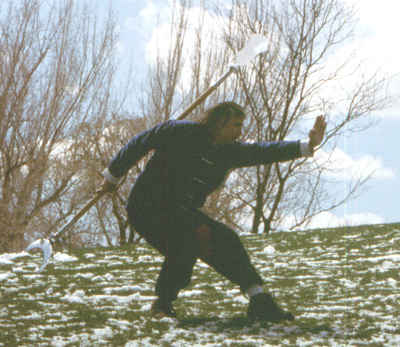 I originally set up Buddha Kung Fu with the condition of the highest belt rank levels to learn ANY Chinese halberd. 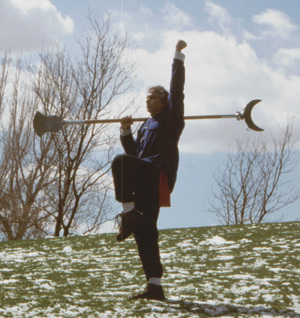 Although I'll gladly teach all the other halberds, I am going to rewrite the rules to make the Shaolin Monk Spade a requirement of the school, instead of any option. 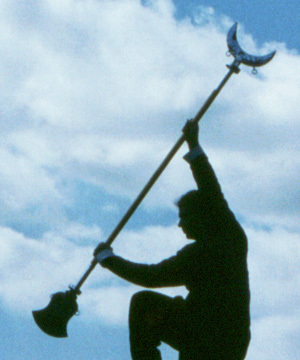 The Monk Spade was designed by Shaolin Monks 1,000 years ago, or more. They were already carrying around their wood staffs... but, when you're on the battlefield, expediency outweighs benevolance... especially against soldiers on horseback trying to cut your head off! This is our LUOHAN SALUTE with Monk Spade. The Luohan (Lohan, Law Horn...) are the guardians of Shakyamuni Buddha in the Buddhist Heaven. Some ancient Buddhist art detail 18 Luohans guarding Buddha. 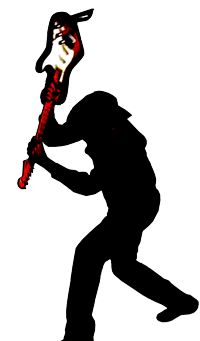 Each Luohan is depicted with a different weapon. 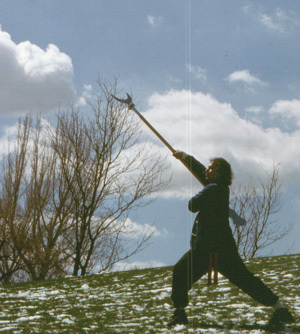 That's why traditional Shaolin Kung Fu schools, like Shaolin Chi Mantis, teach 18 Classical Weapons. They include the trident pitchfork because 1,000 years ago there was a good chance there might be a pitchfork nearby in ancient China. The crescent end of the staff is for dismounting the enemy. Shaolin Kung Fu utilizes bone alignment as much as muscle power. In the above photo you can see that the staff and rear leg are aligned and the rear knee is locked: so I can rely on my bone strength instead of muscle strength. There are a lot of unique ways to get under a horse rider. 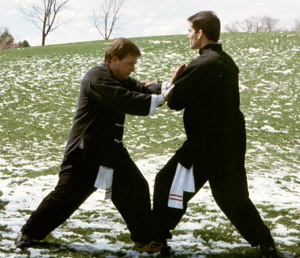 The RED SASH is the instructor level sash of Tai Chi Youth. 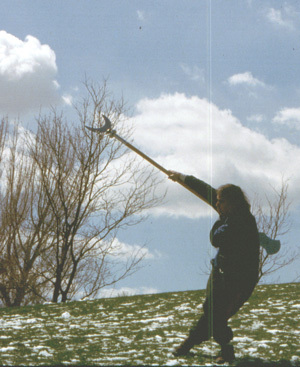 Tai Chi Youth nonprofit doesn't teach weaponry. BLACK SASH + 7 GREEN STRIPES. You start with a white sash and add 10 blue stripes to it. That's a Buddhist concept: start life pure and white... grow up and learn evil... then become pure and white again. 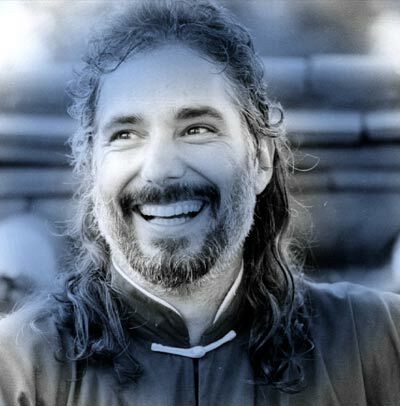 This photo is very old Chinese style: lots of "Heaven space" above me in the picture.